July 14, 2012 was the day my Carnival Paradise fun times began. The fun ship set sail for Grand Cayman and Cozumel, Mexico and my first cruise adventure began. I remember us hanging out on an upper deck in the hot sun, waiting for the ship to leave. My family had lunch in the Paris Restaurant and had to participate in a safety drill before it was time for the ship's departure around 4 p.m. Suddenly, there was a loud "Honk! Honk!" as the ship got ready to set sail. Carnival Paradise made a right turn out of the pier and was off from the Gulf of Mexico to the Caribbean Sea. After we departed the Tampa Port, I started to explore the big fun ship. 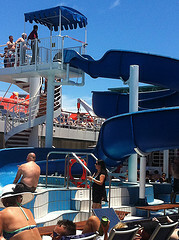 I took the elevator to deck 10, the Lido Deck, the place where all the "splishing" and splashing happen. There was a huge water-slide and all the kids went on it. Next, I played a round of mini golf. Then later that evening we went to a sit-down dinner in the Elation Restaurant. I had shrimp for my main course, and for dessert a melting chocolate cake. Day 2 of my Carnival Paradise fun times, was our first day at sea. I did the same things as the day before. I went to deck 10 and the song "The Wobble" came on. I started dancing like there was no tomorrow. For breakfast, it was buffet style of just about all you can imagine. For lunch I got a hamburger with a lot of fries. Later, I went to the pool on the Lido Deck, but could not get my hair wet because that evening was the Captain's Celebration and I had to look drop-dead gorgeous. We all dressed up later that day, took some great family pictures. I must say that I looked beautiful. We had a special treat for dinner - lobster was on the menu and that is what I ordered. The lobster served on Carnival Paradise was so good! 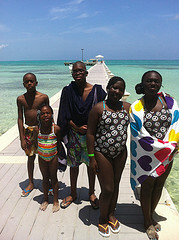 Day 3 of our Carnival Paradise cruise was our first stop in Grand Cayman. We were met by our cousin, Andre, who took us around the island and then to a beach called Run Point. 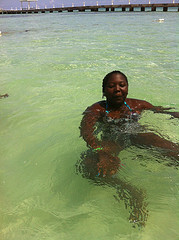 The water was very clear and salty. My cousin had never my sister and I and he was happy to meet us. While I enjoyed the water, another highlight was finding what I thought was a seashell. However, I noticed that something was living in it and my uncle told it was snail. Grand Cayman was a great stop and Day 4 in Cozumel was just as great, but this is where I'll stop writing about my Carnival Paradise fun times on this Carnival "funship." 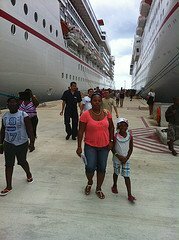 I know you that your family will enjoy your inclusive Carnival Paradise cruise, whenever you decide to sail. Join in and write your own page! It's easy to do. How? Simply click here to return to Carnival Paradise Cruise Reviews.